in my humble opinion, every social gathering should include a cheese plate. it's the polite thing to do and it really helps bring people together, fighting over their cheeses of choice. 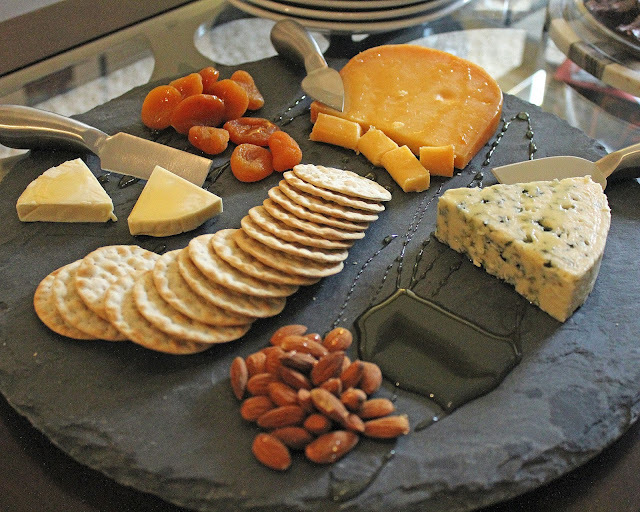 in all seriousness, mastering an awesome cheese plate is pretty much an adult requirement. there are a few things to know in order to make the most of your cheese plate. first, you need a cheese plate and servers. this doesn't have to be super fancy or expensive but it's important to have a large enough surface to be able to spread out all your goodies. my cheese plate is a slate lazy susan and I randomly found it at costco. it also came with little markers that you can write on with chalk, I find those to be annoying to manage so I don't use them. secondly, pick your cheeses and crackers. be sure to get at least one type of cheese that everyone will like such as smoked gouda or even a white cheddar. I love moldy cheese so I always add gorgonzola or bleu cheese. ahhhh so good. lastly, I typically add a soft cheese such as brie or chevre (goat cheese). as for crackers, it's nice to have a couple choices if possible. I like carr brand but crackers are largely personal choice. I usually keep them simple though - while cracked pepper and sea salt crackers sound amazing, it can become too much with your cheeses and other toppings. you can see below the large anchors of the cheese plate are the cheese and the crackers. arrange your cheese and crackers on the plate first and cut a few chunks out to get people started. cheese plates can be intimidating if they look too nice, no one wants to be the first to cut the block - so go ahead and do that for your guests. just a few chunks is fine to loosen things up. lastly, your accoutrements. if you look up accoutrement in the dictionary, you'll see the word accessory as a synonym. 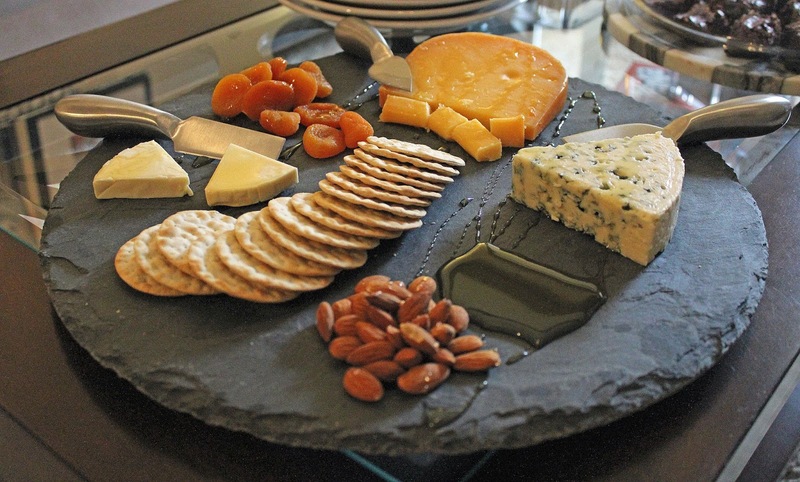 think of your cheese plate accoutrements as accessories to heighten the presentation and taste. you need a full range of accessories for your cheese plate, including salty and sweet. salty: nuts are always a good choice, almonds and cashews are my preference. olives also make another salty accoutrement alternative. sweet: apricots are my favorite. grapes and figs do well too, along with any other fruit. lastly, you need to add some type of jam, chutney, or honey. I typically do honey because I like to drizzle it all over the plate and also add a pool of it to the plate so people can grab more. local honey is best. you can also use red pepper jam or there's a blueberry lavender jam that I like. get creative and try different options. what's your favorite cheese or accoutrement? I don't know about you, but all this talk about cheese plates has got me seriously hungry for some gouda and gorgonzola with a big glass of wine! labels: cheese plate, f&b., sides.